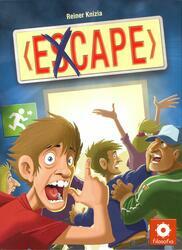 Excape is a quick game that revisits the principle of "stop or again". The objective of the players is to reach first the box of arrival marked with an X closing a course of 20 boxes. In turn, a player rolls two dice. To determine the result of his combination, he uses the die whose value is highest for the decade and the other for the unit. For example, a player who gets 5 on one die and 3 on the other has a score of 53 for his combination. He then places his two dice on a space on the scale numbered from 0 to 5 in the center of the game board. If an opponent gets a better combination of dice, he will be able to eliminate the opposing dice from the board. On the other hand, if a pair of dice remains in play, its owner advances his pawn by the number of spaces indicated on the step on the course of the plateau. The players can raise the die as many times as they wish. But beware, throw too much and you could get an X! You will lose your turn and have to back down! Will you stop in time?